Nic Petan was quite the mixed bag of results for the Winnipeg Jets in 2017-2018. On one hand, he only put up five points at even strength… On the other hand, he was able to produce eight points on the power play. What do you make of an offensive talent that doesn’t produce much except some power play production? Petan has all the signs of a player who will likely score a lot more the next season. He has a severely low shooting percentage, but quality shot selection. Petan produced 57 shots in 54 games, and based on both his even strength and power play shot selection choices, there is no way we should expect that 1.8 per cent shooting percentage to persist. If we merely use his AHL shooting percentage, we would expect Petan to score about five or six more goals. He has a severely low PDO, with the Jets scoring on 4.74 per cent of shots with him on the ice and opponents scoring on 8.92 per cent of shots with him on the ice. Ultimately, we would suggest that Petan puts up more points next season even if he were to perform and were used almost identically everywhere else as last season. GAR struggles with players like Petan. I’ve noted before, but Petan had a very Jekyl and Hyde season. It’s normal for players to do relatively better playing with the top skilled players than they do with the weakest links, but Petan’s case was different. Unlike the norm, the top skilled players performed better with Petan than their usual while the weakest skaters actually played worse with Petan. This is fairly unique situation, and not one that model accounts for in constructing it’s EV Offense and Defense impacts. As noted previously, Petan did not produce much but there were a lot of signs that his low scoring was highly unsustainable and unlikely to persist at such a low rate. Petan will never be a pure finisher but we should expect more goals in the future, and a lot more assists. Even from the eye-test, there were many moments I can recall of Petan almost putting one away or Chris Thorburn and Brandon Tanev struggling to finish Petan’s excellent passes. We also discussed about Petan’s usage and inconsistency with his linemates. Petan has spent the bulk of his career with Chris Thorburn. In fact, there are only two lines that Petan has played more than 50 minutes with: Andrew Copp – Chris Thorburn and Brandon Tanev – Chris Thorburn. In both of these cases, the lines produced below 40 per cent adjusted Corsi. In fact, Petan has a 59.3 per cent adjusted Corsi when you look at his six next most common lines, making up 207 minutes with players like Andrew Copp, Joel Armia, Blake Wheeler, Kyle Connor, Drew Stafford, Nikolaj Ehlers, Marko Dano, and Mark Scheifele. What does all of this mean? Often we expect players to perform like their results in the past given enough sample. Petan though had two very different type of results. The truth is usually in the middle, although a lot of the underlying numbers suggest that the upper bound may be closer to reality than the lower bound. Microstatistics provide a window into the actions that players take that create the results they do in the previous sections. They allow us to see why Petan performs in the manner he does. Petan is a classical set up man. He passes, quite a lot for his ice time and given that his linemates tended to be those who cannot receive passes very well. He builds up play, earning himself many secondary and tertiary shot assists. However, he also produces a solid amount of primary shot assists, unlike a player who simply cycles in the offensive zone like a Shawn Matthias or Drew Stafford. One interesting bit is Petan’s volume of dangerous shots. While Petan does not take many shots, he does tend to take a lot of premium shots. Earlier we talked about Petan’s shot quality but that was revolving the location of where he was taking his shots. This data looks instead to how the shot was created in terms of passing plays prior. This further lends evidence that Petan will likely have a far greater shooting percentage than his 1.8 per cent, and could even finish above league average in the long run (although will never likely score many goals with his low shot quantity). With over 60 games tracked, Nic Petan actually leads the Jets in percentage of defensive zone touches leading to an exit, with 86.2 per cent. Despite being a skilled player with the puck, he has a slightly below average percentage of his exits being possession exits, although he still ranks much better than Stafford, Matthias, Tanev, or Thorburn. 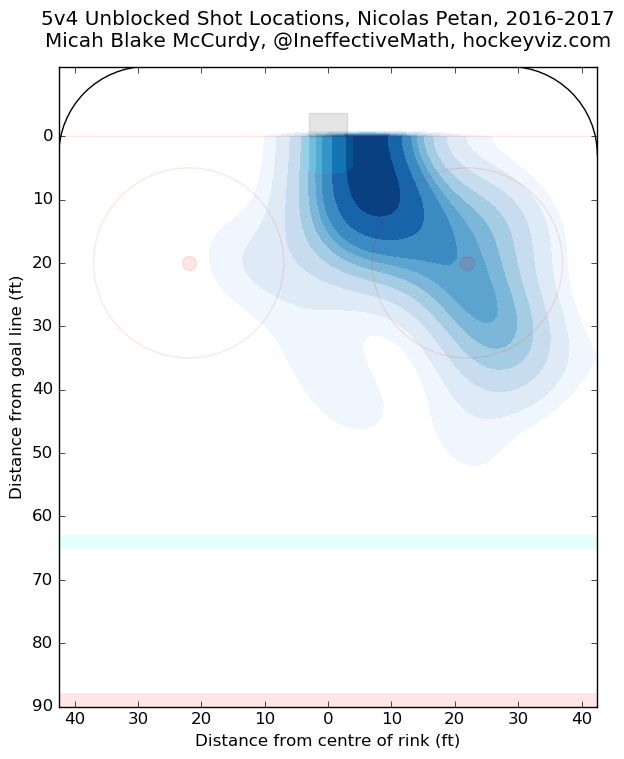 In entries, Petan is fairly average in gaining zone with control of the puck, but has a near team high in 24 per cent of his entries resulting in a successful pass (Scheifele sits at the top at 33.3 per cent). Interestingly, the team performed fairly average in shots generated from Petan’s carries but they generated a ton of shots from his dump-ins. This is most likely due to him spending a lot of time with Thorburn and Tanev, who are subpar players but did forecheck fairly successfully. 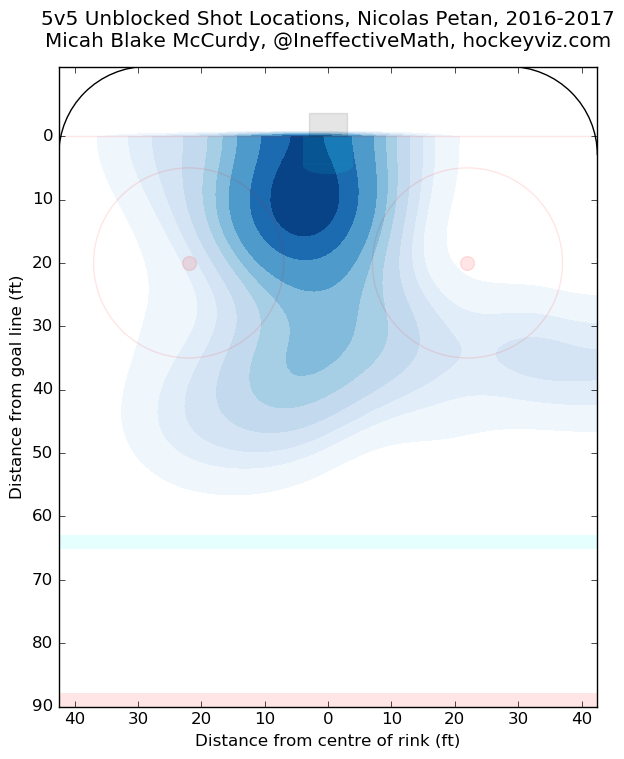 So far we have 49 offensive zone passes tracked for Petan, 10 of which have been into danger zone areas. Petan has a preference for low-to-high passes, with 12 in total, but he’s also generated quite a few in the home plate as well. I like Petan and think he’ll be a very useful middle-six forward for the Jets for a long while. He was not quite ready, or really built for, the role the Jets placed him in last year. Petan is a play maker. He makes passes to those that can put the puck in the net, so don’t stick him with players who never put the puck in the net like Thorburn and Tanev. Ultimately, Petan should be ready for a middle-six role for the Jets. With the team potentially losing one of Adam Lowry, Joel Armia, Mathieu Perreault, or Marko Dano (depending on who they chose to protect) there should be a spot for the small but tenacious forward. The real question is whether or not that spot will be at centre. I’ve spoken before about how the Jets need to change their ways and adjust to a more top-nine forward system, with three lines that score and play with skill. The Matthias-Lowry-Armia line was nice to watch grind away at opponents, but ultimately you do better treating that line more like a high-end 4th line that eats away minutes, and construct another top-six like skill line to leapfrog the Lowry line in minutes.